Stress management & interconnectivity exercises curated for your business or private group. Please inquire. Imagine a circle of candlelight in darkness, dropping you into a cozy, familiar space of I AM. Visualize the candle light around you igniting peaceful passion and deep contentment in your Self. Stand up and breathe deeply. Stretch your arms overhead and turn your face to the sky. Reach down to Earth, bowing in gratitude to her and your radiant Self. This experience includes a guided visualization meditation, restorative movement and creative journaling exercise. 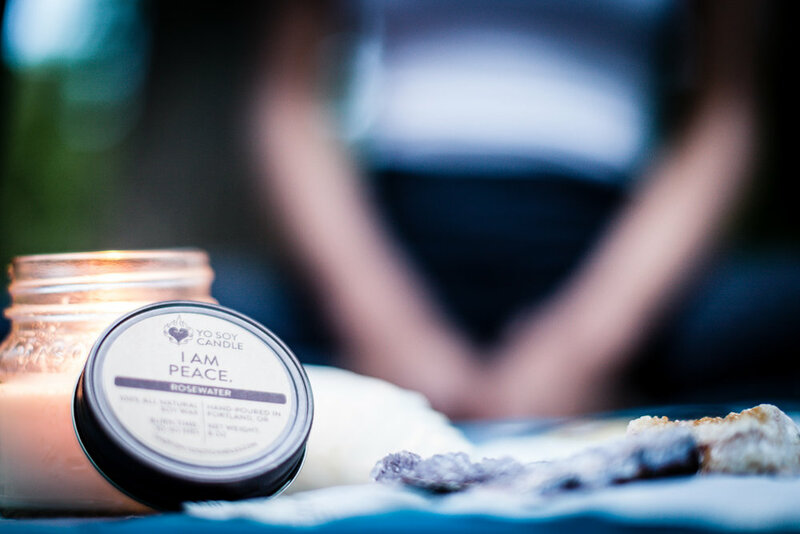 Yours to take home: A Yo Soy Candle box filled with a delicious 4oz seasonal scent + three tealights + I AM guided meditation card to ignite your ritual again and again. Bring your yoga mat, notebook, pen & an open heart. Lovingly and carefully blended Yo Soy scents and affirmations include Sweet Orange Chili Pepper, I Am Grateful; Amber & Driftwood, I Am Connected; Rosewater, I Am Peace...and so many more! Explore more at yosoycandles.com. Learn Thai bodywork techniques that promote restful connection and compassion, and offer many therapeutic benefits of yoga and massage. You will learn stretches, postures and techniques you can easily practice again with your partner at home. We'll get easy vibes going with Thai aromas and a healthy sparkling beverage, share a short and simple flow to get warm, then ease into the experience of Boholistic Thai bodywork therapy with your partner. The evening will be punctuated with restful pauses to learn the philosophy and yogic roots of this lighthearted, moving meditation. Each partner pair will need one mat and one pillow. Wear clothing you can move comfortably in. This workshop is appropriate for any level of knowledge or experience. Some yoga experience may be helpful, but is not necessary. What even is Thai bodywork therapy, you may ask? Thai bodywork therapy is a blend of assisted stretching with therapeutic yoga massage. The treatment is given over comfortable clothing while the recipient relaxes on a floor mat. It shares an ancient lineage with yoga and Ayurveda, with influences from Chinese medicine and other traditional healing modalities.